Matteo Lovatti (Italian, b. 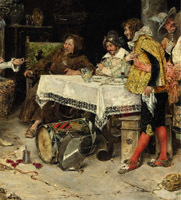 1861) A Fine 19th Century Oil on Panel "The Young Prince's Visit" Depicting an interior tavern scene with a jester introducing and welcoming a young Prince a seated drinking gathering of a monk, two troubadours and a standing server holding a try and being courted by a third troubadour wearing a hat, their drums and ornaments placed under the table. Signed: M. Lovatti, Roma. (lower left). Matteo Lovatti the Younger (Rome, 1861 – after 1909) was an Italian painter, mainly of genre subjects. His grandfather, with the same name (1769-1849) was an architect , who worked for the Papal authorities during the early 19th century. 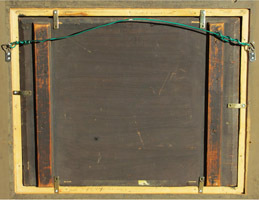 He was influenced by the circle of realist genre painters around Mariano Fortuny in Rome. 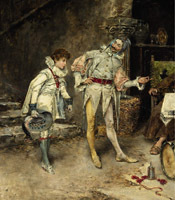 He exhibited in 1880 at Turin: On 14 March 1878 in Roma and that same year in Milan a work titled "Il Piccolo Venditore di Violette" (Young Vilolette Seller). 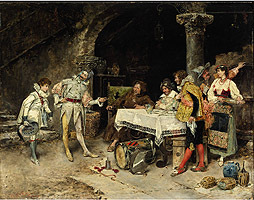 He also exhibited "Vita moderna" (Modern Life) in Rome in 1883, Turin in 1884 "Una partita alle carte and Male Portrait" (A Card Game with Partrait). In 1909 he exhibited at The Watercolor Association in Rome: "Il Vaticano and Villa de' Quintili" (The Vatican and the Villa Quintili). Matteo Lovatti (Italian, b. 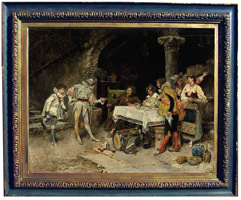 1861) A Fine 19th Century Oil on Panel "The Young Prince's Visit" Depicting an interior tavern scene with a jester introducing and welcoming a young Prince a seated drinking gathering of a monk, two troubadours and a standing server holding a try and being courted by a third troubadour wearing a hat, their drums and ornaments placed under the table. Signed: M. Lovatti, Roma. 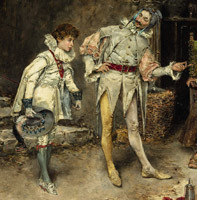 (lower left). Matteo Lovatti the Younger (Rome, 1861 – after 1909) was an Italian painter, mainly of genre subjects. His grandfather, with the same name (1769-1849) was an architect , who worked for the Papal authorities during the early 19th century. 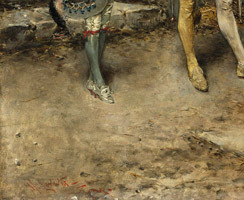 He was influenced by the circle of realist genre painters around Mariano Fortuny in Rome. 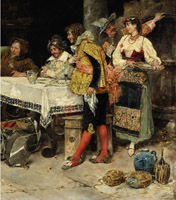 He exhibited in 1880 at Turin: On 14 March 1878 in Roma and that same year in Milan a work titled "Il Piccolo Venditore di Violette" (Young Vilolette Seller). He also exhibited "Vita moderna" (Modern Life) in Rome in 1883, Turin in 1884 "Una partita alle carte and Male Portrait" (A Card Game with Partrait). In 1909 he exhibited at The Watercolor Association in Rome: "Il Vaticano and Villa de' Quintili" (The Vatican and the Villa Quintili).